Is your company one of Canada's Best Workplaces for Employees Living with Arthritis? Canadian employers, working with their private health insurers, are increasingly looking for ways to promote patient-focused prevention, treatment and management of arthritis as part of a health and wellness program for employees. Considering the high prevalence and impact of diseases like rheumatoid arthritis, osteoarthritis and back pain, employers are taking these steps as part of efforts to manage their growing number of arthritis medication claims and risks associated with absence and disability costs. In this month's JointHealth™ monthly, we look at the state of arthritis in the workplace and announce the second annual search for Canada's Best Workplace for Employees Living with Arthritis. ACE is again encouraging employees and employers to nominate their company and describe how their work environment considers the unique concerns of employees living with the most common chronic disease in the workplace – arthritis. "We received more than 70 submissions last year, representing a total employee population of approximately 140,000, which told us there was real interest on the part of Canadian companies to further strengthen their approaches to creating a more productive and arthritis friendly workplace. During our exchanges with employees and employers, we created opportunities for companies to assess their awareness of arthritis and support system for employers living with the disease. We look forward to doing the same in 2015." Arthritis is the most common health reason why Canadians have to stop working and leave the workforce. This can have profound consequences for employees and their families, financially and in terms of personal well-being. Successful Canadian companies are paying more attention to the needs of these employees, underlining the significant role Canadians living with arthritis have in the work force and economy. Dr. John Esdaile, Scientific Director, Arthritis Research Canada, said: "Thanks to the increased awareness of the capabilities of employees with arthritis through programs like Canada's Best Workplaces for Employees Living with Arthritis, more Canadians are able to continue working with varying degrees of adaptations and adjustments, providing a win-win situation for both employers and employees alike." There are currently more than 4.4 million people living with osteoarthritis. 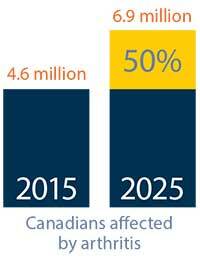 Within a generation (in 30 years), more than 10 million (one in four) Canadians are expected to have osteoarthritis. There will be a new diagnosis of osteoarthritis every 60 seconds, resulting in almost 30% of the employed labour force (one in three workers) having difficulty working due to osteoarthritis. In addition, approximately 500,000 Canadians will be suffering with moderate to severe disability due to osteoarthritis. Of particular relevance for employers and insurers is the category of inflammatory arthritis (rheumatoid arthritis, ankylosing spondylitis, psoriatic arthritis and gout), which affects approximately 2.8% of Canadians. Rheumatoid arthritis strikes more than 272,000 people, approximately 1% of the Canadian adult population, which will increase to 1.3% over the next 30 years. 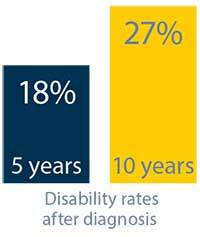 Approximately 0.74% of the employed labour force, or 1 in 136 workers is suffering from RA. Within a generation, this will increase to 1.5%, or 1 in 68 workers. A study by Dr. Diane Lacaille, a senior scientist at Arthritis Research Canada, showed rheumatoid arthritis work disability rates at 18% within five years after diagnosis and 27% within 10 years after diagnosis – significant rates, given that onset of rheumatoid arthritis commonly occurs in an employee's 30s to 50s. Dr. Lacaille, who is a world leader in research on the effects of arthritis on working life expectancy, also found those who continue to work will eventually experience a decline in productivity as missed workdays increase and on-the-job output falls. Loss of productivity is brought on by the limitations imposed by pain and reduced joint mobility, as well as the onset of comorbidities such as depression, cardiac disease, internal organ damage, and osteoarthritis. The burden of disease can also spread to family members, who are called upon to provide increasing levels of care for people with rheumatoid arthritis whose independence diminishes as their disease progresses. of Canadians living with arthritis have not told their employer. As a result, these employers and employees are unable to work together to develop positive plans and approaches that make sense for both of them. Dr. Diane Lacaille is the Principal Investigator for a research study – Arthritis and Employment: Making it Work. This research is a natural extension of Dr. Lacaille's previous studies on work disability, which led to the development of a novel intervention to help people with inflammatory arthritis maintain employment. This unique program, called Making It Work, was created to improve the management of employment issues. It fills an important gap in the health care services available for people with arthritis, and has a great potential for improving quality of life and reducing the large indirect cost (e.g. presenteeism and absenteeism) of arthritis. 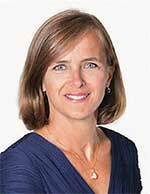 As part of the Phase III study, Dr. Lacaille and her team have converted the self-management program into a web-based program so that the benefits can be offered to a larger number of people with rheumatoid arthritis. The program is unique worldwide in that it combines the benefits of group sessions focused on improving self-management, with assessments by health professionals specifically addressing employment. The web-based technology for delivery of the program is at the leading edge of trends in the field of adult education and self-management. This research is one of few initiatives worldwide to develop and test the effectiveness of interventions specifically targeted at employment. If you reside in British Columbia, Alberta or Ontario, have a form of inflammatory arthritis and are working in paid employment, you may be eligible to participate in this study. For more information, please contact Pam Rogers at makingitwork@arthritisresearch.ca. Unlike 20 years ago, when medical treatment aimed at merely controlling symptoms of rheumatoid arthritis, the goal now is to eradicate inflammation. "We're looking at remissions," said Dr. Lacaille, "because that's the only way we can prevent the joint damage and the physical disability." Using an arsenal of disease-modifying anti-rheumatic drugs (DMARDs), both traditional and biologic, the approach is to treat early and aggressively. "Research studies that have looked at instituting treatment within the first months of having symptoms actually show remission rates of a third and sometimes up to almost a half," she said. "We're looking at remissions, because that's the only way we can prevent the joint damage and the physical disability." What does aggressive treatment mean? "We have to get to the patients with our DMARDs early on, reassessing them regularly and constantly modifying them—increasing, switching, adding—until we reach our target of no swelling, no markers of inflammation and no X-ray progression." The more expensive biologics are used only after failure of traditional DMARDs. In Canada, just 10% to 15% of rheumatoid arthritis patients are on biologics. Not only are the biologic DMARDs effective in improving physical function, pain and fatigue, they can also arrest progression of the disease, Lacaille asserted. She acknowledged that for some patients it can take four to six months for the drug to take effect, but others describe it as "a miraculous drug, because with one infusion or one injection they feel like their old selves." Employers, large and small, are creating workplaces that are friendlier to people with arthritis and meeting the challenges arthritis poses to an employee's health and to a company's bottom line. To recognize these efforts, Arthritis Consumer Experts is conducting its second annual countrywide search for best arthritis practices in the Canadian workplace as part of the Canada's Best Workplaces for Employees Living with Arthritis program in 2015. Based on the written submissions and interviews with employers and employees of nominated companies, ACE will partner with its scientific partner, Arthritis Research Canada, and evaluate nominations using three criteria areas: Organizational Benefits, Physical Workplace and Employee Education. Categorizing companies by size (small, medium and large), a judging panel will conduct employee surveys, which are taken anonymously, and analyze company practices and programs compared to other candidate companies based on specific metrics such as workstation adaptability, flexible hours, employee education, and extended health benefit plans. The deadline for applications is 5:00 p.m. EST on July 24, 2015 and winners will be announced during Arthritis Awareness Month in September 2015. To determine if your company is eligible for Canada's Best Workplaces for Employees Living with Arthritis program, please visit: jointhealth.org. Close to three in five people (58%) with arthritis are less than 65 years of age, which has significant impact on participation in the labour force. The cost of biologic response modifiers to treat forms of inflammatory arthritis is now one of the fastest growing categories of medications for employer sponsored private plans across Canada. Early referral for diseases such as rheumatoid arthritis and ankylosing spondylitis can lead to early diagnosis and treatment with better long-term results helping to decrease pain and swelling, maintain joint structure and function and prevent permanent disability and loss of employment. Studies by Arthritis Research Canada and other leading researchers have found that early treatment with medications can reduce the short and long-term costs associated with arthritis, work disability claims being largest among them. Quite often, appropriate arthritis medication or treatment can mean the difference between lifelong disability and return to a mostly normal life. The ability for employees living with arthritis to have meaningful conversation about their unique health challenges with their healthcare professional – from family physician, pharmacist to occupational- and physio-therapists – is vitally important to address absenteeism and presenteeism focused on medication management. Over the past 12 months, ACE received unrestricted grants-in-aid from: AbbVie Corporation, Amgen Canada, Arthritis Research Canada, BIOTECanada, Canadian Institutes of Health Research, Celgene Inc., Hoffman-La Roche Canada Ltd., Janssen Inc., Pfizer Canada, Purdue Pharma L.P., Sanofi Canada, UCB Canada Inc. and the University of British Columbia. ACE also receives unsolicited donations from its community members (people with arthritis) across Canada.